In Florida, personal injury includes any harmful act, intentional or accidental, for which the law can provide a solution. This means that there are many different types of personal injury. They range from inflicting bodily injury to another person, to destroying someone’s property or reputation, or wrongly denying someone his or her rights. One of the most common forms of personal injury are motor vehicle accidents. According to the Florida Department of Highway Safety and Motor Vehicles Traffic Crash Statistics, there was 395,785 total traffic crashes in 2016 that resulted in 3,176 deaths. The report also states that there was about 1000 car crashes per day in Florida that year. 2. Make sure you and your passengers are OK. If possible, move away from the road and oncoming traffic. Do not leave the scene of the accident. Turn on your hazard lights to warn other commuters. 3. Call 911 and specify if someone has been hurt. Staying alert and acting fast can save a life. Assist anyone who may be injured. Provide first aid if possible, but do not move a seriously injured person unless absolutely necessary because movement can increase injuries. 4. Contact your attorney as soon as possible and do not admit guilt to anyone. Do not discuss the accident or give statements to anyone other than the police, and your attorney. 5. 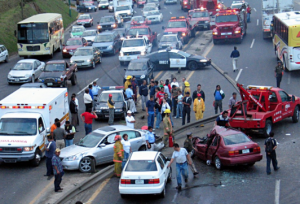 Exchange vital information with all parties involved in the car accident. Get the name, address, phone number and license numbers for all drivers and witnesses. Also note the date and time of the collision, and the make and model of all vehicles involved. Take pictures of the damages. Do not trust your memory. 6. Contact your insurance company and report the accident. You may be compensated for medical expenses, lost wages, pain and suffering, and physical impairment if you or a loved one has been injured in a car accident due to another driver’s mistakes, negligence, or criminal behavior. The Law Offices of Shannon J Sagan can assist you in this procedure. We will help you assess the damage and will guide you with your claim. Call us today at 1800-fla-lawyer for a free consultation.